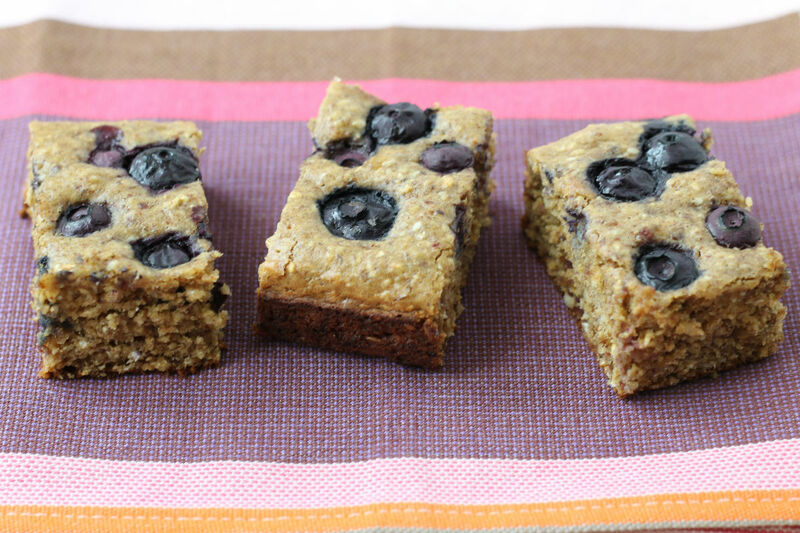 These blueberry snack bars are perfect for after school, for breakfast, or any time your kids need a power snack! 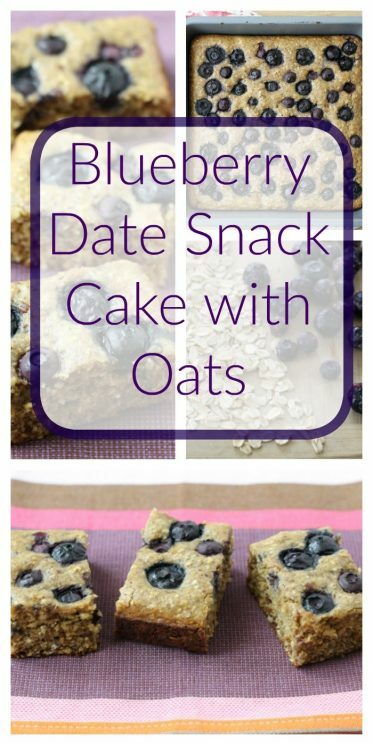 Homemade snack cake is a perfect option for lunches, snacks, and dessert—especially when it contains the fruit, healthy fats, and complex carbohydrates that our kiddos need. 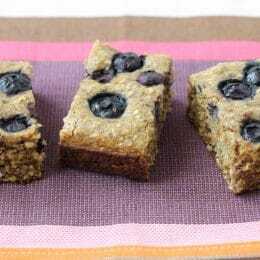 This Blueberry Date Snack Cake, which is gluten free and made without refined sugar, is one of my family’s favorite versions. When sliced, the cake bars are moist and soft, with a faint nutty flavor, and slight crispness around the edges. It manages to taste both wholesome and indulgent, which is exactly what you’d want from a baked good with “cake” in its name. 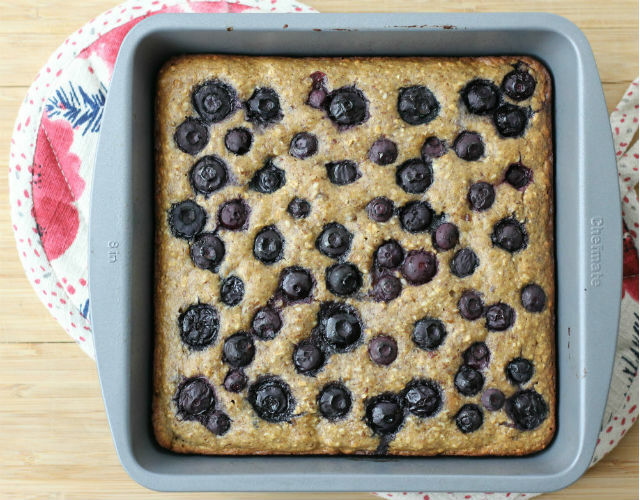 It boasts protein from almond butter and eggs, healthy whole grains and fiber from oats, antioxidants from blueberries, and sweetness from dates. You can store slices in the fridge in an airtight container for up to a week or in the freezer for up to 3 months, so you can make this ahead of time and serve up slices whenever hunger strikes. Plus, the batter comes together in a food processor, so you won’t have to wash up a sink full of dishes after making the recipe! Let us know if you decide to try these or if you try them with different fruits! Strawberries or raspberries would be so delicious! We sometimes top individual portions with cream cheese when we’re at home for an extra-special snack, though it’s pretty delicious on its own. 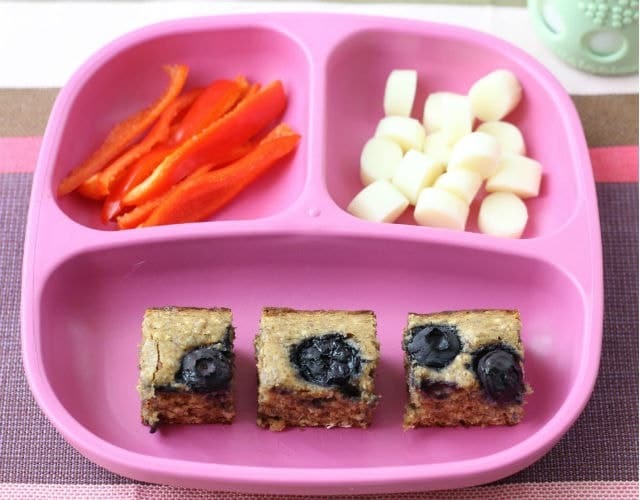 Amy Palanjian lives with her energetic little girl and husband in small town Iowa and shares recipes and toddler-feeding tips at Yummy Toddler Food. Place the dates in a bowl, cover with water, and soak for 1 hour. Drain, pat dry, and remove pits. Preheat the oven to 350 degrees F and grease an 8×8-inch square baking pan. Place the oats into the bowl of a food processor and grind into a coarse flour, like the texture of instant oats. Add the baking powder, salt, flaxseeds, sesame seeds, eggs, almond butter, vanilla, and dates. Process until smooth, about 15-30 seconds. Pour into the prepared pan and smooth with a spatula. 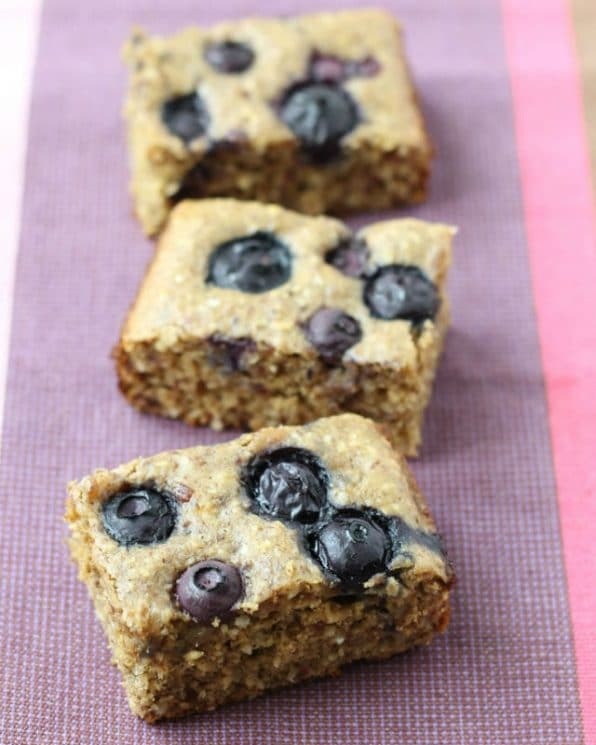 Sprinkle the blueberries over the top and press gently into the batter. Bake for 32-35 minutes or until a cake tester inserted into the center of the pan comes out cleanly. Cover with foil for the last 10 minutes of baking to prevent the edges from browning too deeply. Place the pan onto a wire rack and let cool completely before slicing. Slice into bars, place into an air tight container or a zip top bag, and store in the fridge for up to 5 days or in the freezer for up to 3 months. Makes 16-20 bars. How can this be Gluten free when it contains rolled Oats? Judy- in the United States, things are a little different. 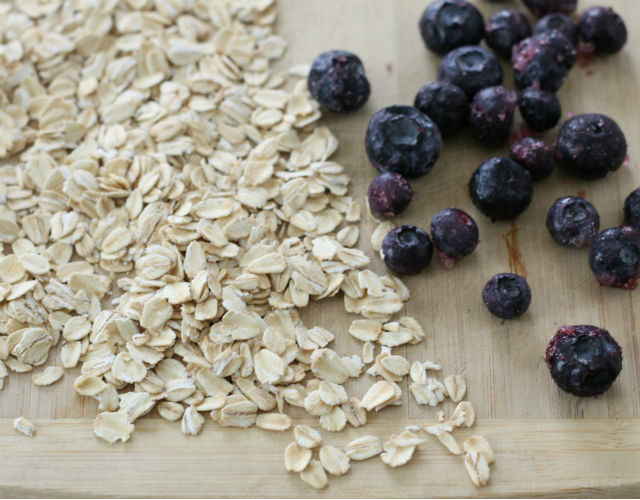 It’s been accepted that oats processed in a gluten free facility are considered gluten free. I do realize Australia and New Zealand do not consider oats gluten free, regardless of their processing. How can medjool dates be used for this recipe? Use them exactly as the recipe states. They work the best in this recipe. Hi, my children go to a nut free school, what would I ne able to use instead of almond butter? Do you recommend fresh or dried dates? I assume dry, but you don’t specify. Fresh medjool dates would work if you can find them, but you can simply soak dried ones to have good results as well. Is it necessary to pre-load the dates? What does this do. Also, Mine from the store are already pitted. Presoaking the dates hydrates them and creates a moister final result with a better texture. The dates also blend better when soaked, so I recommend that you do that step. Medjool dates work best and it’s totally find if they are already pitted. I liked these but found them a little dry. How can i make them more moist? Shorten bake time? Less oats? Hi Molly. Soaking the dates is key to the moisture in this recipe, but if you did that for the time suggested and you still found the recipe to be dry, you could shorten the baking time slightly (though check the center with a cake tester to make sure it comes out clean to ensure that it’s baked through OR add 2 tablespoons of brown rice syrup or honey. Can I use instant oat? Or wheat flour? While I haven’t used them, I imagine that instant oats would work fine. Just keep in mind that they won’t need to be ground as much as rolled oats. What can I use instead of almond butter? You could use melted and slightly cooled butter instead of almond butter if that is a better option for your family. How would leaving out the eggs work? Or using maybe flax eggs? My family is allergic to eggs.